AverageBro: Rest In Peace, Air McNair. Rest In Peace, Air McNair. The avalanche of death continues. While history will likely remember Steve "Air" McNair as a scrambler who could never win the big one, I prefer to remember him as a trailblazer. He's the only guy in the modern era picked high (#3 pick by the Oilers) from an HBCU (Alcorn State) to actually play QB, which it pretty amazing considering how NFL coaches (used to?) like turning black QB's into WR's or DB's. McNair's career is a testament to hard work and gritty character. As impressive as his win/loss record was, it's sad to think what might have been had he played in a big media market for an owner that wasn't a tightwad. 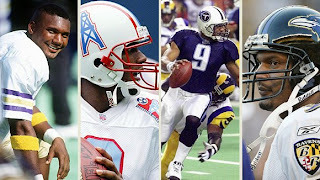 The franchise succeeded in spite of itself, running McNair and Eddie George into the ground, while never surrounding them the the level of complimentary players necessary to go all the way. Still, McNair left an indelible mark on the game, and he will be missed.